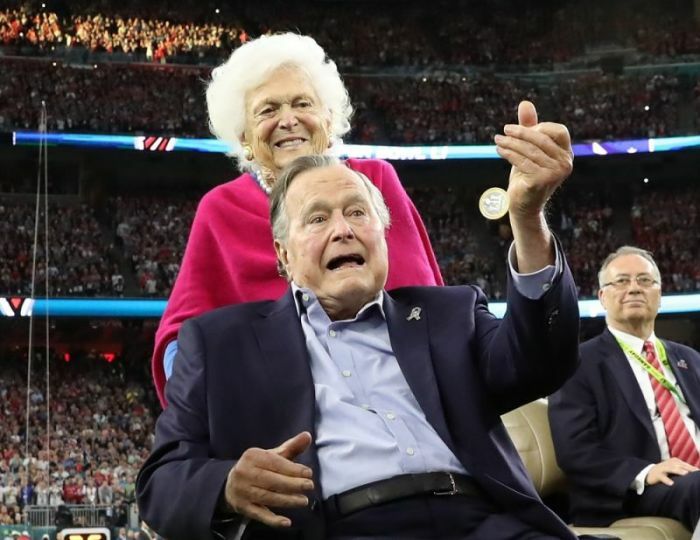 George H. W. Bush recently celebrated his 93<sup>rd birthday. In four and half months, he is on course to surpass Ronald Reagan and Gerald Ford as the former president who lived the longest. His son George W. is much better known for his religious convictions, but the senior Bush has a very strong faith as well, which significantly shaped his character and policies as president. Bush was raised by devout Episcopalian parents and remained affiliated with this denomination almost his entire life. His father Prescott, a Republican senator from Connecticut, and his mother Dorothy led family worship every morning, using readings from the Episcopal Book of Common Prayer and A Diary of Private Prayer by Scottish Presbyterian theologian John Baillie. They strove to teach their children how the Bible applied to daily life. While worshipping for many years at Episcopal churches in Houston, Washington, and Kennebunkport, Maine, Bush's theology and social policies have more in common with evangelicals than with many fellow Episcopalians. While flying a combat mission for the Navy in September 1944, Bush's plane was severely damaged on a bombing mission, forcing him to parachute into the Pacific Ocean south of Japan. The Japanese hunted him, but a U.S. submarine picked him up. Bush thanked God for saving his life and asked, "Why had I been spared and what did God have for me?" Their three-year-old daughter Robin's battle with and eventual death from leukemia in the early 1950s both tested and deepened Bush's faith. He declared that "prayer had always been part" of his and his wife Barbara's lives, but it became more fervent during this ordeal. "Our faith," Bush testified, "truly sustained us." Bush saw God as active and all-powerful and the Bible as divinely inspired and authoritative. "One cannot be America's President," the Republican frequently asserted, without "the strength that your faith gives to you." The Bible, which had helped shape America's values and institutions, Bush attested, "has always been a great source of comfort to me." He affirmed that Jesus was God's divine Son and frequently referred to Christ as "our Savior." Moreover, Bush peppered his speeches with biblical quotations, precepts, and stories to underscore his positions. Bush began his 1989 inaugural address by praying, "Heavenly Father, we ... thank You for Your love." Strengthen us "to do Your work." Make us "willing to heed and hear Your will, and write on our hearts these words: 'Use power to help people.'" Bush's cabinet meetings always began with prayer. The Bushes prayed together every night before going to sleep. "My husband," Barbara declared, "prays and believes enormously." During his presidency, Bush referred to prayer in 220 different speeches, proclamations, and remarks. In hundreds of letters Bush thanked citizens for praying for him and testified that he drew "great strength" from their prayers. Bush continually exhorted Americans to seek God's aid in dealing with the nation's problems. No other chief executive asserted as often as he did that the United States was "one nation under God" and accountable to Him. God, the Texan averred, placed Americans on Earth "to do His work." "Without God's help," he declared, "we can do nothing," but "with it, we can do great things." As president, he wrote dozens of letters assuring Americans that God would help them cope with the challenges of life. Bush repeatedly insisted that both individuals and nations should adhere to transcendent moral norms and that America was founded upon Judeo-Christian principles. Government, he argued, had a limited, but important, role to play in promoting the common good and remedying social ills. "It is very important," Bush declared, "to follow the teachings of our Heavenly Father in carrying out the responsibilities of government." The federal government, he insisted, could not remedy America's many social ills by itself. Alleviating them also required the active efforts of local governments, parents, teachers, businesses, and churches. While Bush's faith helped shape many of his policies, it was perhaps most evident in his Thousand Points of Light Initiative. In more than 500 speeches and public statements, Bush urged Americans to increase their personal efforts and financial contributions to aid the less fortunate. Service to others, Bush asserted, advanced Christ's mission. He beseeched Americans to emulate "the selfless spirit of giving that Jesus embodied." Bush strove to create a society where serving others became "part of everyone's everyday thinking." His Points of Light initiative did help significantly boost volunteerism. Individuals logged millions of hours helping needy individuals during Bush's four years in office, and almost 25 years after Bush left office, Points of Light "is the world's largest organization dedicated to volunteer service." Many have testified to Bush's staunch Christian commitment. Thomas Bagley, the rector of St. Martin's Episcopal Church in Houston to which Bush long belonged, declared that he "would not ever do anything he thought to be contrary to our Lord and Master." In 1989, four Methodist bishops applauded the Republican's "strong Christian faith" and "devotion to the church." In naming Bush and his wife Barbara "Episcopalians of the Year" in 1991, The Anglican Digest praised the president's "strong spiritual leadership" and "commitment to Christ and His Church." The head of the Fellowship of Christian Athletes wrote Bush in 1991: "your faithfulness as a prayer warrior became so evident during Desert Storm as you led our nation to trust in God. Dr. Gary Scott Smith is the retired chair of the history department at Grove City College and is a fellow for faith and politics with The Center for Vision & Values. He is the author of "Suffer the Children" (2017), "Religion in the Oval Office" (Oxford University Press, 2015), "Faith and the Presidency From George Washington to George W. Bush" (Oxford University Press, 2009), "Religion in the Oval Office" and "Heaven in the American Imagination" (Oxford University Press, 2011).